This woman with four children fled from war-torn Donetsk and now lives in an apartment in Krasnoarmeysk. As a result of fighting, their house was destroyed. They were also assisted. They convey gratitude to everyone who helped them. We grieve deeply for the people who are suffering horribly in Eastern Ukraine. They are caught in the war supported by Russia against Ukraine. We are praying for the war and killing to stop and for God to protect the vulnerable who have nowhere to go in this winter. Some are being evacuated and resettled. More than a million are homeless. 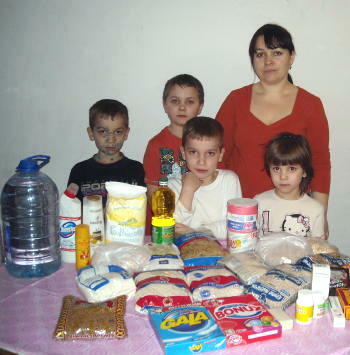 LifeNets has worked in Ukraine for fifteen years in addition to work with foundations and churches before that. We have trusted people who can deliver relief to elderly and help families with children. We will provide continued reports about the help we give. Can you help? Why do You stand afar off, O Lord?Why do You hide in times of trouble? 2 The wicked in his pride persecutes the poor;Let them be caught in the plots which they have devised. 3 For the wicked boasts of his heart's desire;He blesses the greedy and renounces the Lord. 4 The wicked in his proud countenance does not seek God;God is in none of his thoughts. 5 His ways are always prospering;Your judgments are far above, out of his sight;As for all his enemies, he sneers at them. 6 He has said in his heart, "I shall not be moved;I shall never be in adversity." 7 His mouth is full of cursing and deceit and oppression;Under his tongue is trouble and iniquity. 8 He sits in the lurking places of the villages;In the secret places he murders the innocent;His eyes are secretly fixed on the helpless. 9 He lies in wait secretly, as a lion in his den;He lies in wait to catch the poor;He catches the poor when he draws him into his net. 10 So he crouches, he lies low,That the helpless may fall by his strength. 11 He has said in his heart,"God has forgotten;He hides His face;He will never see." 12 Arise, O Lord!O God, lift up Your hand!Do not forget the humble. 13 Why do the wicked renounce God?He has said in his heart,"You will not require an account." 14 But You have seen, for You observe trouble and grief,To repay it by Your hand.The helpless commits himself to You;You are the helper of the fatherless. 15 Break the arm of the wicked and the evil man;Seek out his wickedness until You find none. 16 The Lord is King forever and ever;The nations have perished out of His land. 17 Lord, You have heard the desire of the humble;You will prepare their heart;You will cause Your ear to hear, 18 To do justice to the fatherless and the oppressed,That the man of the earth may oppress no more.